Last week we talked about dealing with those who’ve hurt us, in ‘Relational & Family Pain’. We addressed the idea that forgiving is like taking Buckley’s Cough Syrup; it can taste really bad & be hard to do but is good for us in the long run. This week calls for taking a little more Buckley’s as we grapple with what could be an even tougher subject, our need to initiate forgiveness in order to overcome past hurts and bitterness. A new holiday trend is literally turning a traditional Christmas celebration upside down. 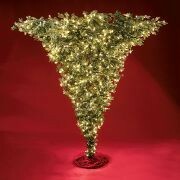 Hammacher Schlemmer, a retail company based in New York, is currently offering a unique yuletide decoration: the Upside-Down Christmas Tree. Standing at 7-feet tall and pre-lit with over 800 commercial grade lights, this technological marvel can be yours for the low price of $599.95. But why would anyone want an upside-down Christmas tree? According to Hammacher Schlemmer's website: "The inverted shape makes it easier to see ornaments, which hang away from the dense needles," while "allowing more room for the accumulation of presents underneath." Other retail outlets are following suit, including ChristmasTreeForMe.com, which offers 5-to-7.5-foot bizarro trees from $280 to $504. Even Target is getting in on the action, with upside-down trees ranging from $299 to $499 on its website. The retail giant claims that the trees "leave more room on the floor for gifts." Because we all know that Christmas is for giving, right? What would it take to turn your Christmas upside down? Not finding them there, they dragged out Jason and some of the other believers instead and took them before the city council. "Paul and Silas have turned the rest of the world upside down, and now they are here disturbing our city," they shouted. If we will commit ourselves to the following ideas that speak to us right out of the Bible, we will turn Christmas upside down. Let me ask you a question. How many of you have loaned something out and it hasn’t yet been returned? Hands up for all to see. How many of you have borrowed something that you haven’t yet returned? Notice that it’s fewer than had their hands up previously. That’s because all the jerks that don’t return things go to other churches, right? It’s easier for us to remember when we’ve been hurt as opposed to remembering when we’ve hurt others. We’re a self-obsessed people. I am & so are you. Character growth means that we become God-obsessed, which is to be other-obsessed, too! Let’s examine our own heart today. Let’s take inventory and ask ourselves have we wronged somebody? Let’s let Jesus teach us how to deal with it today. "So if you are standing before the altar in the Temple, offering a sacrifice to God, and you suddenly remember that someone has something against you, leave your sacrifice there beside the altar. Go and be reconciled to that person. Then come and offer your sacrifice to God. Come to terms quickly with your enemy before it is too late and you are dragged into court, handed over to an officer, and thrown in jail. Today we’ll Stop, Drop and Give. We’ll learn to initiate forgiveness and turn Christmas upside down. 1. Stop and acknowledge those you have hurt. It’s always much easier to see your own pain. So if you are standing before the altar in the Temple, offering a sacrifice to God, and you suddenly remember that someone has something against you, leave your sacrifice there beside the altar. Have you ever been shopping at the Mall and you see someone that you recognize but want to avoid? You quickly head down another aisle to miss running into them. Anyone done this? Hands up. Well there’s a flip side. They’ve seen you too and are planning their getaway at the same time! We avoid people. We avoid pain and issues in our families and our past. We pretend that the issue will go away if we ignore it long enough. Alcoholism, anger issues, anorexia, and the list could go on. Those are only the A’s in the A, B, C’s! We turn and go down the other aisle in our families and friendships. We never go to a deeper level of insight in our relationships. Our pain stunts our maturity and we literally stop growing inside. Our character fails to match up to our chronological age. We tend to judge others by their actions. If you have a book of mine I judge you because you haven’t returned it: your actions are speaking, most notably their lack. But if I have a book of yours I always mean to return it but just keep forgetting: I judge myself by my intentions. Dads, we love our kids, but they often don’t know it. The number one broken down relationship is that grown children don’t feel close to their dad. As a dad, we know our hearts, filled with love for our kids; we just don’t know how to express it! We judge our intentions as dads, our kids judge our actions and we have broken relationships. You are loving and kind to thousands, though children suffer for their parents’ sins. All you have to do to verify this is watch an episode of Dr. Phil. Dysfunctional, sinful (sometimes evil) fathers and mothers do leave emotional scars that can hamstring a child for life. Children, however, do not pay for their parent’s sins. You are not being held accountable for the sins of your fathers, even if you are suffering because of those sins. A person who never felt his father’s love and approval is not responsible for their father’s sin, even though it hurts. George Barna has polled the church and discovered that the divorce rate is as bad or even worse in Evangelical churches as with regular society. I think that’s because in the church we can often be more concerned with outward appearances than inward substance. Let’s turn that upside down and get more interested in inward realities and character and less concerned with ‘looking good’ on the outside! We do that by acknowledging those we’ve hurt. You know the game married couples play if you’re upset with each other at bedtime. Go to bed with your backs facing each other. Don’t let any flesh touch or you lose points. Play the silent game until sarcasm leaks out. You wonder who’ll give in and lose but the truth is you’re both losing big time. We’re judging our intentions and they’re judging our actions. Who is it that you’ve hurt? Who is it that I’ve hurt? A husband or a wife? A son or a daughter? A brother or a sister? A business partner or a friend? A coworker or a classmate? In preparation for this talk I had to apologize to an old friend because the last time we were together things didn’t go so well I had to say, ‘I’m sorry’. 2. Drop everything and make it right. Leave your sacrifice there beside the altar. Go and be reconciled to that person. Why the heck can’t we deal with this? Why can’t we plough through the pain and find healing on the other side? Pray that God would give you a chance to initiate forgiveness, to make something right. As a sidebar, if you have something against somebody and they don’t know it, keep it to yourself. If you’ve been judging someone from a distance and internalized it, don’t tell him or her. Don’t go and create a wound! Deal with it internally between you and God. But if you have wounded someone, stop and acknowledge the hurt and then drop everything and make it right! If you have trapped yourself by your agreement and are caught by what you said-- quick, get out of it if you possibly can! You have placed yourself at your friend's mercy. Now swallow your pride; go and beg to have your name erased. Don't put it off. Do it now! Don't rest until you do. Save yourself like a deer escaping from a hunter, like a bird fleeing from a net. Go and get it done. Nothing else matters like relationships. You cannot control somebody else. You can control yourself. If you’re still struggling at this point God may be meaning to teach you about control issues and boundaries. But that’s another talk at a later time. As much as it depends on YOU, live in peace. There’s that darn peace bubble floating around again. We talked about that last week. Know what’s in your control, your boundaries, and what are another person’s boundaries. 3. Give our hearts and our gifts to God. Give to God after working out the relationship with the person. And so, dear brothersand sisters I plead with you to give your bodies to God. Let them be a living and holy sacrifice--the kind he will accept. When you think of what he has done for you, is this too much to ask? What matters most to God is relationships. Your relationship with God and your relationship with others. Teacher, which is the most important commandment in the Law of Moses?" Jesus replied, "`You must love the Lord your God with all your heart, all your soul, and all your mind.' This is the first and greatest commandment. A second is equally important: `Love your neighbor as yourself.' All the other commandments and all the demands of the prophets are based on these two commandments." Want to turn your Christmas upside down? Remember that Christmas is forgiving.